Lyveden New Bield is an unfinished Elizabethan summer house set in the heart of rural Northamptonshire, and owned by the National Trust. Begun by Sir Thomas Tresham to symbolise his Catholic faith, Lyveden New Bield has remained incomplete and virtually unaltered since work stopped on his death in 1605. Designed on a plan reminiscent of a Greek cross, the facades have a strict symmetry. The building has two floors above a raised basement, with mullioned and transomed windows. Each floor had three rooms with a staircase in the south projection of the cross. The exterior of the building is decorated by friezes of a religious nature. 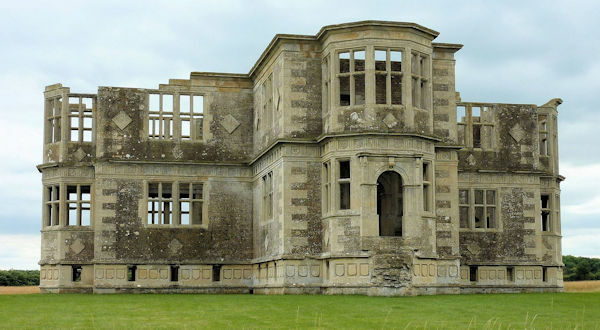 New Bield was on the estate of Tresham's second home, the once grand Lyveden Manor House, also known as Old Bield, which had been in the Tresham family from the 1400s. Today, little remains of Old Bield - the gatehouse was been moved elsewhere and the staircase was transported to America, where it was incorporated in the Edsel and Eleanor Ford House near Detroit. Only one wing remains. New Bield was probably never intended for full-time occupation. It is too close to the main house for use as a hunting lodge, so it may have been intended for use as a Secret House, a place where the head of the household would retire for a few days with a minimum of servants, while the principal house was thoroughly cleaned and, bearing in mind the sanitation of the time, fumigated. Sir Thomas Tresham died in 1605 following decades of religious persecution, his once vast wealth having been severely depleted. His son Francis Tresham inherited the estate, but that year, along with his cousins Catesby and Wintour, he became involved in the Gunpowder Plot. Thus, within a year the estate had a third owner, Francis's son Lewis Tresham. Lewis, a spendthrift, lost the remaining family wealth and the estate was eventually sold following the death of his son in 1643. Text based upon information from the National Trust website and Wikipedia. Illustration taken from Wikipedia. Thanks to Mark Swingler for pointing me to this building.